Built for the victims of Chile's 8.8-magnitude earthquake back in 2010, this bunch of fluorescent green buildings form a school where neighborhood children can come to learn. Insulated, made from local materials and flooded with natural light, Santiago's Escuela Santa Matilde creates a bright new future for the area's kids. Designed by LAND Arquitectos, the school was built following 5 sustainable principles commended by Holcim, who collaborated to build the school. The school’s 5 principles were that it should be easy to replicate, be socially equal, include ecological qualities and energy conservation, be low-cost and have a strong contextual and aesthetic impact. LAND Arquitectos worked with simple standard materials to fast-build these prefab shelters that could be easily replicated in case of a new emergency. The whole project was built within social equity aiding a basic education school in need after a natural disaster. High roofs, skylights and 2-inch double-skin walls save energy, let the air circulate freely and get rid off extra humidity. 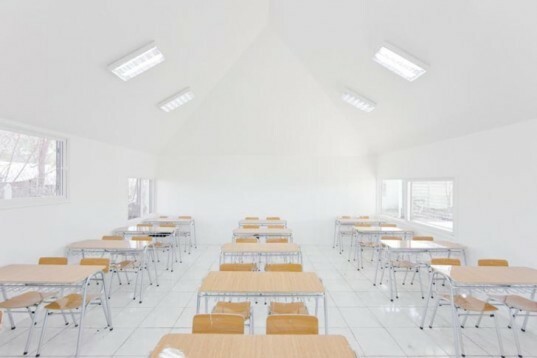 The roof’s skylight lets the hot air scape while bringing lots of free natural light reflecting on the walls and giving the classrooms the name of atrapaluz (light traps). Long-lasting, affordable materials, good insulation and sufficient ventilation make sure these shiny study shelters have a bright green future. Excellent! 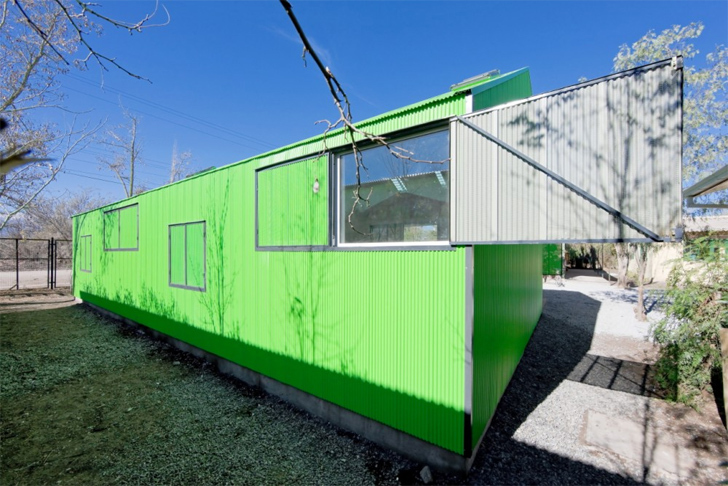 Fluorescent Green Prefab Schools that looks good for the school children. http://www.kottagerv.com are now and should become the norm in building houses around the world to help save the environment. The school's 5 principles were to be socially equal, include ecological qualities and energy conservation, be low-cost and have a strong contextual and aesthetic impact. LAND Arquitectos worked with simple standard materials to fast-build these prefab shelters that could be easily replicated in case of a new emergency. The whole project was built within social equity aiding a basic education school in need after a natural disaster. High roofs, skylights and 2-inch double-skin walls save energy, let the air circulate freely and get rid off extra humidity. The roof's skylight lets the hot air scape while bringing lots of free natural light reflecting on the walls. The school's 5 principles were that it should be easy to replicate, be socially equal, include ecological qualities and energy conservation, be low-cost and have a strong contextual and aesthetic impact. LAND Arquitectos worked with simple standard materials to fast-build these prefab shelters that could be easily replicated in case of a new emergency. The whole project was built within social equity aiding a basic education school in need after a natural disaster. Long-lasting affordable materials, good insulation and sufficient ventilation make these shiny study shelters have a bright green future.